A lot (read: most) of Rubyists are focused on one aspect of software engineering: web development. This isn’t necessarily a bad thing. The web is growing at an incredible rate and is definitely a rewarding (monetarily and otherwise) field in which to have expertise. However, this does not mean that Ruby is good just for web development. The standard repertoire of algorithms is pretty fundamental to computer science and having a bit of experience with them can be incredibly beneficial. 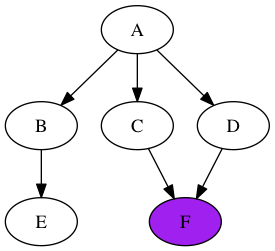 In this article, we’ll go through some of the most basic graph algorithms: depth first search and breadth first search. We’ll look at the ideas behind them, where they fit in with respect to applications, and their implementations in Ruby. Alright, so there: we have a graph. But, what if we want a structure that can represent the idea that “A is related to B but B isn’t related to A”? We can have directed edges in the graph. Now, there is a direction to go with each relationship. 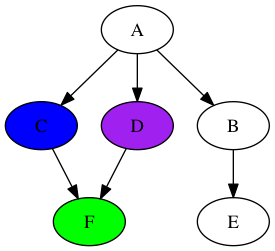 Of course, we can create a directed graph out of an undirected graph by replacing each undirected edge with two directed edges going opposite ways. 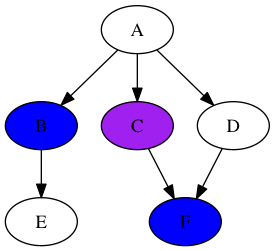 Say we’re given a given a directed graph (G) and two nodes: (S) and (T) (usually referred to as the source and terminal). We want to figure out whether there is a path between (S) (T). Can we can get to (T) by the following the edges (in the right direction) from (S) to (T)? We’re also interested in what nodes would be traversed in order to complete this path. There are two different solutions to this problem: depth first search and breadth first search. Given the names and a little bit of imagination, it’s easy to guess the difference between these two algorithms. Before we get into the details of each algorithm, let’s take a look how we can represent a graph. 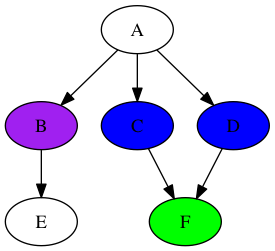 The simplest way to store a graph is probably the adjacency matrix. Let’s say we have a graph with (V) nodes. We represent that graph with a (V x V) matrix full of 1’s and 0’s. If there exists an edge going from node [i] to node [j], then we place a (1) in row (i) and row (j). If there’s no such edge, then we place a (0) in row (i) and row (j). 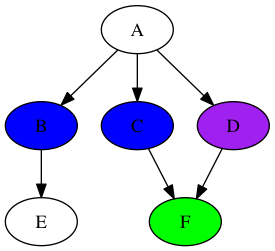 An adjacency list is another way to represent a graph. For each node (i), we setup lists that contain references to the nodes that (i) has an edge to. What’s the difference between these two approaches? 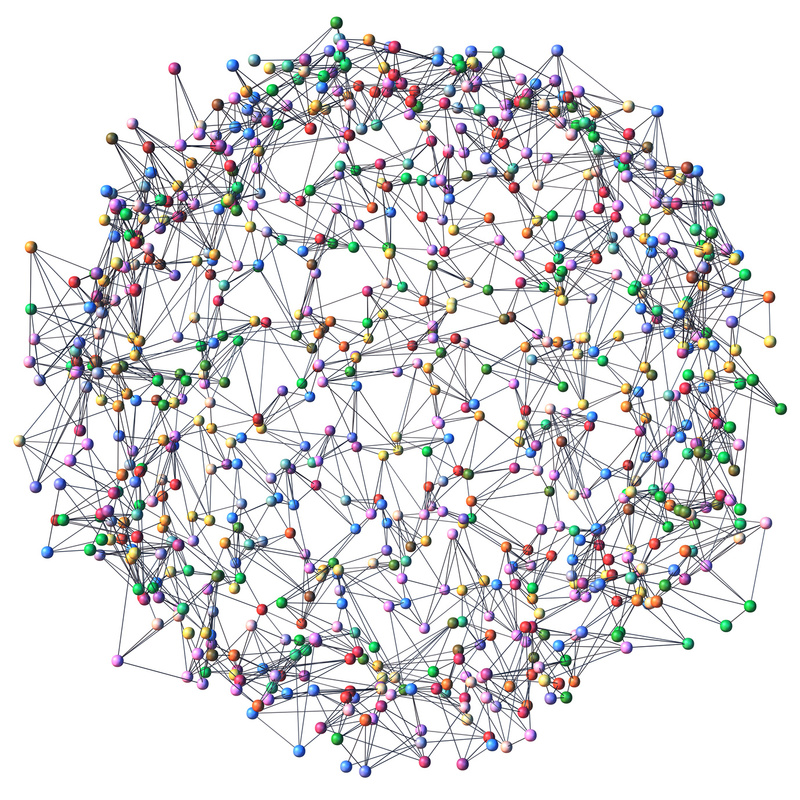 Say we have a graph with 1000 nodes but only one edge. With the adjacency matrix representation, we’d have to allocate a (1000*1000) element array in order to represent the graph. 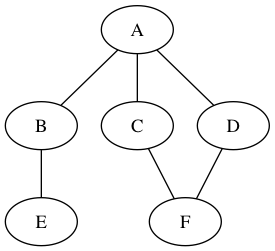 On the other hand, a good adjacency list representation would not need to represent outputs for all for the nodes. However, adjacency lists have their own downsides. 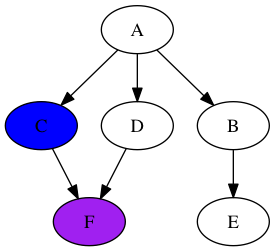 With the traditional implementation of linked lists, it takes linear time in order to check if a given edge exists. For example, if we want to check if edge (4, 6) exists, then we have to look at the list of outputs of 4 and then loop over it (and it might contain all the nodes in the graph) to check if 6 is part of that list. On the other hand, checking if row 4 and column 6 is 1 in a adjacency matrix takes a constant amount of time regardless of the structure of the graph. So, if you have a sparse graph (i.e. lots of nodes, few edges), use an adjacency list. If you have a dense graph and are doing lots of existence checking of edges, use an adjacency matrix. For the rest of the article, we’ll be using the adjacency matrix representation mostly because it is slightly simpler to reason about. Let’s take a look at the fundamental problem again. Basically, we’re trying to figure out whether or not we can reach a certain node (T) from another node (S). Imagine a mouse starting at node (S) and a piece of cheese at node (T). The mouse can set off in search of (T) by following the first edge it sees. It keeps doing that at every node it reaches until it hits a node where it can’t go any further (and still hasn’t found (T)). Then, it will backtrack to the last node where it had another edge it could have gone down and repeats the process. In a sense, the mouse goes as “deep” as it can within the graph before it backtracks. We refer to this algorithm as depth first search. In order to build the algorithm, we need some way to keep track of what node to backtrack to when the time comes. To facilitate this, we use a data structure called a “stack”. The first item placed on a stack is the first one that will leave the stack. That’s why we call the stack a LIFO (last in, first out) structure – the “last in” element is the “first out” element. The mouse has to keep a stack of nodes as it travels through the network. Every time it arrives at a node, the mouse adds all possible outputs (i.e. children) to the stack. Then, it takes the first element off the stack (refered to as a “pop” operation) and moves to that node. In the case that we’ve hit a dead end (i.e. the set of possible outputs is empty), then the “pop” operation will return the node to which we can backtrack. You might be wondering what would happen if node F wasn’t reachable from node A. Simple: at some point, we’d have a completely empty stack. Once we reach that point, we know that we’ve exhausted all possible paths from node A. 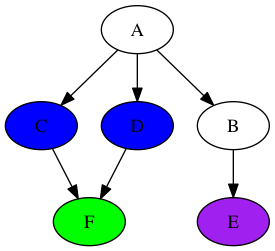 We have to pass in adj_matrix, which is the adjacency matrix representation of the graph implemented as an array of arrays in Ruby. We also provide the indices of the source and terminal nodes (source_index and end_index) within the adjacency matrix. The stack starts off with the source node. This can be thought of as the mouse’s starting point. Although here we’re using a standard Ruby array for our stack, as long as the implementation gives a way to “push” and “pop” elements (and those operations behave the way we expect them to), the stack implementation doesn’t matter. The code uses a forever loop and then breaks when we encounter certain conditions. Here, we pop the current node off the stack and reak out of the loop if the the stack is empty or it’s the node we’re looking for. This part is a bit wordy, but the goal is pretty simple. Out of the adjacency matrix, pick the “children” of curr_node by checking the 1’s in the adjacency matrix. That’s a quick implementation of depth first search. In practice, you’ll want a more complex definition of what a “node” is, since they are rarely just indices and often have data attached to them. But, the general concept of depth first search stays the same. 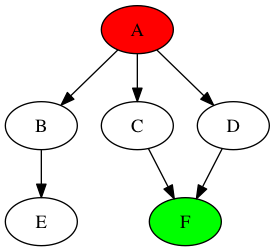 Note that our implementation only works for acyclic graphs, i.e. graphs in which there is no loop. 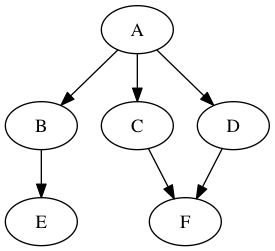 If we want to also operate on cyclic graphs, we’d need to keep track of whether or not we’ve already visited a node. That is a pretty easy exercise; try implementing it! What if we have a graph where we have a 10,000 node long path that contains a bunch of nodes we don’t care about? Then, usin depth first search might end up traversing that enormous path for absolutely no reason. That’s where breadth first search comes in. Instead of going down a path, we “spread out” our search across every level of the graph. Imagine taking a jug of water and pouring it into the source node. If the edges are pipes, the water should flow through each “level” of the graph (as determined by the distance from the source node) and possibly reach the terminal node. There are really only two important bits to this code. Since we are adding elements to the beginning of the list, taking an element from the end of the list would give us the element inserted first not the element inserted last. Thus, slightly altering our management of the node list changes the behavior of a queue. Typically, you’d want to wrap this sort of thing in a class or module and give it enqueue and dequeue methods to clarify the fact that we are using node_queue as a queue. Here, once again, breadth first search will only work if we don’t have a cycle in our graph. To include graphs with cycles, we need to keep track of nodes we have already “discovered”. Modifying the implementation to do this is quite straightforward and a recommended exercise. I'm a developer, math enthusiast and student.